Are you ever amazed by the willingness of many a marketer to hang on to outdated and ridiculous concepts, even after they’ve been proven woefully inaccurate and even dangerous to the successful management of a brand or business? I find myself amazed several times a day, sadly. One of the most amazing, long-lived and ludicrous concepts is the idea that adding, “my tweets are my own,” to your bio somehow gives you a pass on sharing something potentially volatile. Although I’d seen those five little words on plenty a Twitter profile, I didn’t really think about them all that much until I started listening to the Unpodcast, hosted by Scott Stratten and Alison Kramer. In one of their awesome Moron Mountain segments (bring back the mountain, pretty puh-leeze) they shared this reprehensible social media saga. Ding, ding, ding! When you share socially, you’re sharing publicly. And guess what? Once you put something out to the public, you lose any chance of pussyfooting around about your intent and purpose. Privacy is only possible when you keep an idea, concept, tweet, rant or other ridiculosity to yourself! Once It’s Published, It’s No Longer Private! Let me drive the point home … it ain’t your own if you choose to share it on a public platform! Once that idea is published it takes on a life of its own. When you put it out for public consumption it then has the potential to be shared, discussed, dissed, misconstrued, maligned, talked about and even torn apart. 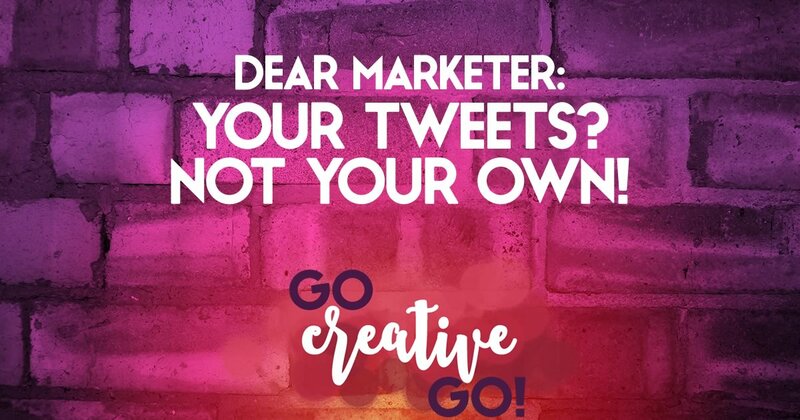 Much like there’s no such thing as a social media marketing ninja, there’s no way to publicly share a thought and at the same time keep it private and protected. I often post a pithy phrase when I see something that bothers me. I never, however, expect that everyone in my feed will agree with my sentiment. I’m always prepared for discussion and dissension in the ranks. If you can’t back up your idea, if you can’t handle dissenting opinions and direct discussion, maybe you should rethink that specific share. Once it’s out there, there’s little chance that you can make it completely disappear. It’s been retweeted, screen capped and shared to Facebook, even discussed in a blog post or a popular podcast. Undoing is MUCH harder than taking the time to think through what you plan to share. It’s MUCH easier and MUCH smarter to choose not to share something if you think it has the potential damage your personal or brand reputation. A disclaimer isn’t going to deliver you from the potential backlash. While your post has lost all potential for privacy once published, you still own it. Your name or handle is attached to that original post, and is passed along with each retweet, each share and each screen grab. Are you ready to own up to an idea that has the potential to create some serious dissent. If not, it’s time to consider shutting up rather than sharing! http://www.gocreativego.com/wp-content/uploads/2015/10/GCG-pinnable-tweet-own.jpg 1080 735 Mallie Hart http://www.gocreativego.com/wp-content/uploads/2016/07/GCG-sitelogo-new.png Mallie Hart2015-10-21 08:12:522016-09-20 17:32:42Dear Marketer: Your Tweets Are NOT Your Own! “Tweets my own” can also mean that they are actually by you, and not some social media lackey tweeting on your behalf. That way, as a follower or observer, you know who you’re tweeting and who’s replying/interacting with you. To the point of responsibility to the brand, legally (based on internal legalese and corporate employee policy), “tweets my own” can save a brand from a lawsuit based on an employee’s mistake. While consumers may or may not buy it – and, let’s be fair, that’s more down to how well a brand treats a consumer rather than an idiot on Twitter saying something he shouldn’t have – it does offer an out. I’ve never seen any of my peers use My Tweets are My Own in the way you’ve mentioned, Danny. That, of course, doesn’t mean that I just haven’t seen that specific practice in use. I really fail to see how brands are legally exempt if someone posts that in a Twitter bio, though. Would make for an interesting follow-up, though, don’t you think? At present, I absolutely fall into the “not buying” category! At the organization where I work, we have 18,000 employees, across multiple lines of business. The social media policy put in place ties in with the corporate code of conduct, and has been worked on with my team as well as multiple others, and legal. The differentiation comes between representatives of a company, and spokespeople. Representatives are “normal employees” who have personal social media accounts. They may share work-related news, but it doesn’t mean they speak on behalf of the company (because they don’t). Spokespeople are different, because they officially speak on behalf of the company. They can be social media comms managers, PR people, corporate comms, media comms, etc. What they say impacts the company directly (as opposed to possibly reflecting on the company). Reps may say something silly that needs HR involvement, but it’s not a view of the company, hence the “tweets my own”. Spokespeople, on the other hand, is a far different kettle of fish, and could have legal repercussions if an inappropriate social media update is made. You both make valid points. I tend to agree more with Danny’s though. Maybe we should use a different phrase then? Something like: “My tweets are not endorsed by the company I represent”?